Shamsud-din Ali: Seeking a new trial. Imam Shamsud-din Ali should be granted a new racketeering trial because a federal judge erred when he allowed prosecutors to present "irrelevant" evidence of drug dealers' donations to an Islamic school, which Ali directed. That's what Ali's attorney, James J. Binns, argued yesterday for 15 minutes before a three-judge federal appeals panel. "Ali was not charged with drug dealing," he added. 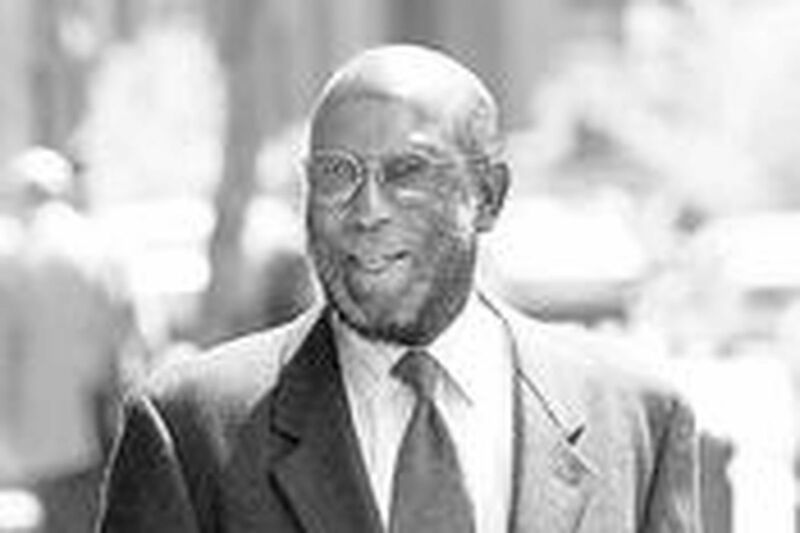 Appellate Judge Julio M. Fuentes told Binns that "receipts in drug dealing were used to maintain the enterprise," Sister Clara Muhammad School, in West Philadelphia. But Binns said only one drug dealer said he had given money to the school to pay the electric and oil bills. "That evidence was only put in to inflame jurors." Anthony J. Sirica, chief U.S. judge for the Third Circuit Court of Appeals, asked, "How would the government explain the great amounts of cash?" Binns said that a witness could identify a person saying "X gave the money," without referring to drugs. "If a case cries out for reversal, this is the case," said Binns, who contended that drugs had been mentioned on "half of the 18 trial days." But Assistant U.S. Attorney Frank A. Labor III argued that U.S. District Judge Bruce Kauffman had used his discretion by limiting drug evidence to three witnesses on one day and repeatedly warned the jury that Ali was not charged with drug offenses. Labor said Kauffman had asked both sides to stipulate that $400,000 deposited in Ali's wife's account "came from an illegal source - in lieu of drug evidence." But that didn't happen because the sides could not agree on a stipulation. Asked why by Judge Fuentes, Labor said that Binns had refused. Kauffman ruled that the drug evidence was admissible during three hearings - one each before, during and after the nine-week trial, Labor said. Arthur L. Alarcon, a visiting senior U.S. Judge for the 9th Circuit, asked Binns if he would have agreed to any stipulation. Binns said he would have agreed to say that "these people gave money" and that Ali and his wife had abused the money given to Sister Clara Muhammad School. Asked if "these people" were drug dealers, Binns said, "I didn't want to say drug dealers." The jury verdict was not a slam-dunk for the government, several noted. Ali was convicted of 22 of 36 counts of racketeering, fraud, extortion and commercial bribery on June 14, 2005. Ali pleaded guilty to four tax- evasion counts. For eight illegal money-making schemes, Kauffman sentenced Ali to 87 months in prison and ordered him to pay restitution of $365,000 to four victims of fraud and extortion, and to forfeit $286,646, a total of more than $650,000. Ever since, Ali has been out on bail awaiting appeal.